Awe-inspiring ocean front home located on the ''No Drive'' section of the beach in Wilbur by the Sea. Built in 2004 by Signature Construction, this custom built Mediterranean style courtyard home offers many outstanding features including first floor block construction built on concrete slab foundation, concrete title roof mechanically fastened with stainless steel screws, two-car garage with epoxy floors and separate ductless mini split AC system, brick paver driveway and courtyard, turtle friendly tinted high impact hurricane windows with electric hurricane shutters, extensive use of exterior accent downlighting surrounding the home, 50' X 167' lot with seawall, built-in Generac transfer switch with hook up for portable generator and two Trane heat pump a/c systems.Enter through the 22 ft foyer complimented by a powdered bisque wrought iron rail wrapping the swirling staircase & wall accent niches. Ground floor oceanfront living room and dining room combo featuring a wall of floor to ceiling windows. Dining room has built-in bookcases, wood burning fireplace and wet bar all perfect for entertaining your guests. Enjoy the fully equipped chef's kitchen with awesome ocean views, functional island with vegetable washing/prep sink, full appliance package including convenient raised dishwasher, double convection ovens, glass cooktop, side by side refrigerator, built in microwave, handcrafted cabinetry with pull out drawers, double under mount stainless steel sink accented by Exotic Brazilian granite counters, breakfast bar, walk-in pantry, tiled back splash and more! A half bath power room is also central to the living, dining, and kitchen. The downstairs guest suite occupies a private wing with adjacent inside laundry room which includes a large deep splash sink and front load side by side washer dryer.Two upstairs guest rooms open into the second floor oceanfront living room and share a luxurious bath with an ocean view soaking tub, under cabinet accent lighting, double sink vanity and walk-in shower. 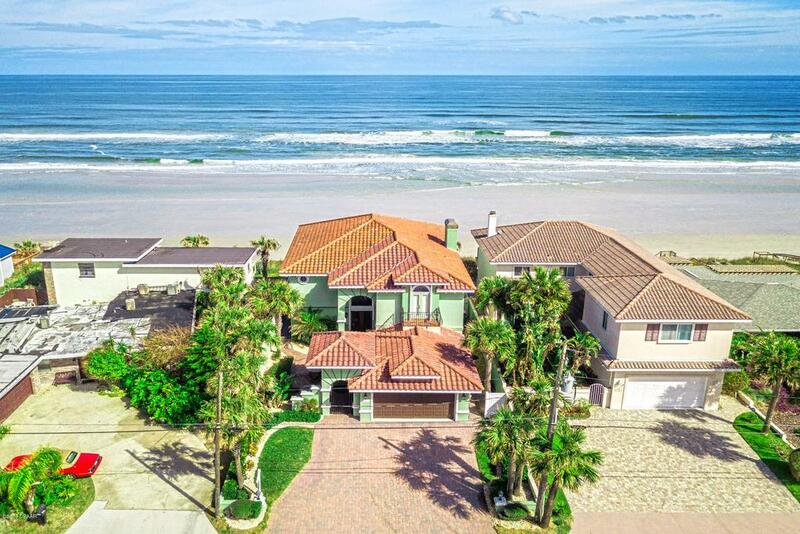 Whether you are looking for an oceanfront retreat for your family and guests, or a full time residence, you don't want to miss this rare opportunity to own this one of a kind waterfront estate!